Adonia Karren Smith, alumna of Georgia School for the Deaf, earned her B.A. in Elementary Education and M.A. in Deaf Education from Gallaudet University, and her Ed.D. in Deaf Education/Deaf Studies at Lamar University—the first GSD graduate to earn a doctorate. She’s a veteran teacher of Deaf students, who all too often have been denied access to ASL-fluent teachers. Her most recent stint was in Frances Hazel Reid Elementary in Leesburg, Virginia. She is one of a rare species—Deaf ASL-fluent teachers with doctorates. Her advocacy is a natural outgrowth of her experience as a teacher. Smith has been actively involved in teaching, not only on an elementary-school level, but also working with college students. She served as Associate Professor in the Department of Deaf Education at Lamar University, Adjunct Instructor in McDaniel College's Department of Deaf Education/Deaf Studies. Smith and E. Lynn Jacobowitz co-founded ASL Rose in April 2004; Smith is now the sole owner. ASL Rose is celebrating its 10th anniversary. Says Smith, “ASL Rose is a very Deaf-centric company that not only is a strong advocate of ASL and English Bilingualism, but publishes and provides ASL-English bilingual-bicultural materials and teacher-education workshops. I believe strongly that all deaf students have a right to education taught in their own native language, and that they have the right to know their culture, their history, and their rights as Deaf people. ASL Rose is supportive of this, and makes it possible for both the teachers and students to have materials they need. “From 1996 through 2000, I taught first-graders at Alabama School for the Deaf. One of the activities that I did with my students was Beau Gardner’s Have You Ever Seen…? An ABC Book. It includes pictures that symbolize each letter of the alphabet, such as an alligator wearing antlers for the letter A. During the activity, I found myself struggling to keep my students engaged. At one point, one young girl said excitedly, “I know! A is LOVE, WITH, and EVERYDAY!” While those words were not the correct answers for the letter A, they were actually the right answers for the handshape A.
Dr. Jacobowitz was working as a professor at Gallaudet University, and serving as the chair of the American Sign Language Teachers Association’s (ASLTA) National American Sign Language Curriculum Project and ASLTA Legislation. 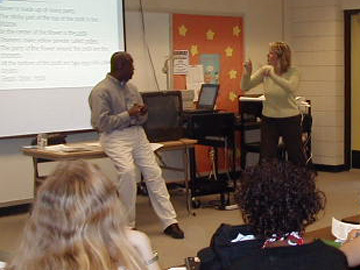 During her term as president (1995-1998), the members of the National ASLTA Curriculum Project developed a skeletal curricula for Deaf ASL speakers and English speakers. The curriculum for English speakers was completed with a list of potential materials, text books, and videos. The curriculum for Deaf ASL speakers was not released due to a lack of availability of suitable materials, textbooks, and videos. It was this lack of resources that led Dr. Jacobowitz to realize that there was a great need for materials developed specifically for native ASL users. The seeds of ASL Rose were planted in April 2001, when Smith and Jacobowitz attended the Deaf Studies VII Conference in Orlando. So on that historic day in April, the two met and put their heads together to discuss the possibility of collaborating on a book/DVD project that would incorporate ASL and Deaf studies. Those seeds blossomed into their very first product: Have You Ever Seen . . .? An American Sign Language (ASL) Handshape DVD/Book, and other projects that are currently in the works. Have You Ever Seen . . .? focuses on playing with visually rhyming handshapes. (There’s an accompanying curriculum.) It’s designed specifically for Deaf children, but can be enjoyed by anyone, adults included. ASL Rose not only publishes children’s fun books and their multimedia formats, but has been actively involved in education, presentations, and advocacy. This is a battle that’s won one mind at a time, one child at a time. Smith is especially proud of ASL Rose’s participation in a life-changing decision. “In December 2013, a Deaf man, Jia Zhang, contacted ASL Rose asking for help in trying to convince his company to approve his job transfer from New Mexico to Texas so that he could secure a bilingual-bicultural education for his Deaf children. The company refused, saying that they needed a letter from a professional saying that his children needed services and education that couldn’t be obtained in New Mexico’s public schools. ASL Rose gladly came to the rescue and wrote a letter on Jia Zhang’s behalf, explaining the benefits of bilingual-bicultural education vs. public school/mainstreaming education. ASL Rose was thrilled to hear that Jia Zhang’s company approved the job transfer, and he could now move to Austin, Texas, in February 2013. She continues to travel nationally and abroad, giving presentations on Laurasia, bilingualism, language access, and Deaf culture. ASL Rose has several new projects in the progress. Coming up: several new children’s books and their multimedia formats, including a Deaf Cinderella, and more Have You Ever Seen . . .? Long may the ASL Rose garden bloom!